Sorry I've been a little AWOL from blogging lately. I've been pretty busy with taking care of my family and home, as well as getting Wild Berries Photography off the ground. But I've had a grammar issue on my mind lately that I'd like to address just in time for all of your customized Christmas projects. Last names that end in S can give folks a lot of problems when they try to make them plural or posessive... or plural and posessive. I've seen it butchered in so many ways since marrying into a last name that ends in S, so I am here to set the record straight. If something belongs to one single Hutchens, you can use Hutchens's, "That is Mr. Hutchens's phone," or Hutchens', "That is Mr. Hutchens' phone." It's apparently a debated topic in the grammar world. As a person who likes cut and dry rules, this bothers me. I prefer Hutchens's for clarity, but I guess it's up to you. Now, let's make it plural. More than one Hutchens would be Hutchenses, pronounced "Hutchenziz." "We are the Hutchenses." If you're going to have a sign in your front yard that says, "The [insert family name]," then it should most definitely say, "The Hutchenses." Or you could say that you are hanging out with the Hutchenses. Or, keeping up with the Hutchenses. (Get it? Like keeping up with the Joneses.) It looks a little funny, but I promise it's right. What if something belongs to many Hutchenses? In that case, it is Hutchenses', which is still pronounced, "Hutchenziz." This is to keep us from ever having to try to say, "Hutchenziziz," cause that's just weird. 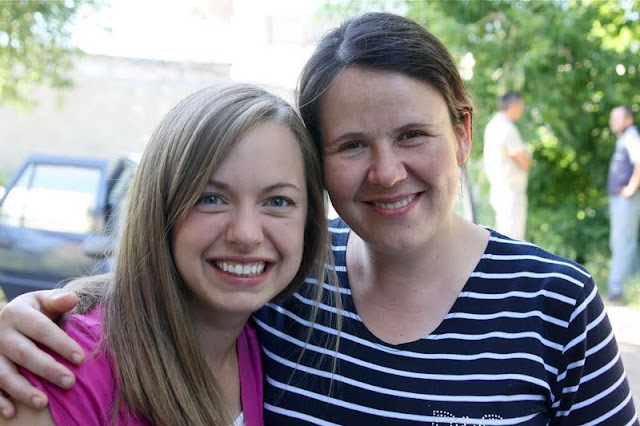 Lilia was the Hutchenses' tutor and friend in Moldova. So you would say, "The Hutchenses' red car is over there." Remember, if you are in doubt on what to say, just go with "The Hutchens family." Works every time. To: The Hutchens Family. That is the Hutchens family's red car. We are the Hutchens Family. And as a bonus, first names that end in S work the same as last names that end in S. It's debated. I prefer to say, "That's Lucas's watch." However, even among those who agree with me, there are a few exceptions, which are historical names like Jesus', Moses', or Odysseus'. There! Now you can go and give grammatically correct Christmas gifts! haha! i was totally planning to comment that, when in doubt, i just use "the (insert name) family," then i got to the end of the post. great minds? for the next grammar post, i think you should talk about when to use "and I" and when to use "and me." i see those two being used interchangeably A LOT on facebook, and it drives me a little bit crazy. THANK YOU. This is one of my top pet peeves. It makes me crazy to see people write "we're praying for the Hutchens" or "we're having the Hutchens over for dinner tonight" !! I was hoping you would say something about the flips side... when people use the possessive for the plural. As in "The Harwell's" when they mean "The Harwells." People do it all the time for their blog title and signing cards. It makes me laugh to think that they probably look at my blog and think, "She got it wrong!"